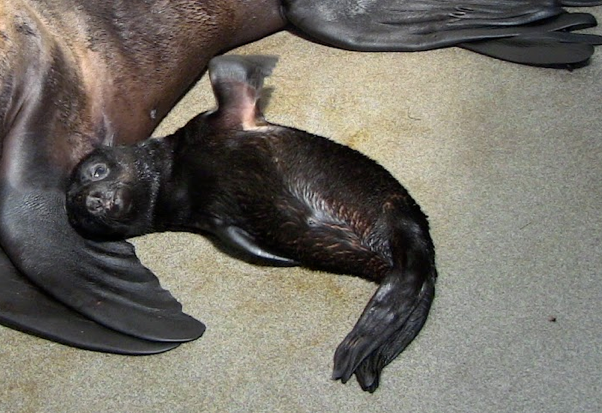 As you probably gathered from the video posted in this entry, our youngest fur seals—Flaherty and Leu—are best buddies. They play with each other all day long (when they're not napping, that is, puppies have to nap). The fur seal pups get into all sorts of activities, like running, swimming, playing king of the rock. Well... you'll see. Just check out our home movies. On Fitness Fridays we like to point out ways our marine mammals are staying active. Running, swimming and playing are all parts of an active lifestyle, which is a key part of staying healthy. Here at the New Balance Foundation Marine Mammal Center, we start that healthy lifestyle young. Newborn Flaherty from earlier this summer. He's much bigger now, but just as adorable!